"I hid in the supply closet until it was time to walk down the aisle," said Joy Lantrip-Cevera of her unconventional wedding at the Four Corners gas station in Oxford, Mississippi. From the outside, the Four Corners looks like any other Chevron station, the kind a traveler might rush past at 75mph anywhere from Pensacola, Florida to Portland, Oregon. But this Chevron station is not like any others. Lantrip-Cevera knows this. She has worked as a kitchen manager there for 14 years. "We printed up fliers and invited the townspeople," she said. She was married in the small aisle next to the station's six formica tables three years ago, surrounded by store employees and regulars. "We have such a small staff -- the only way everyone could be there was to have it at the station." The food was also a no-brainer. 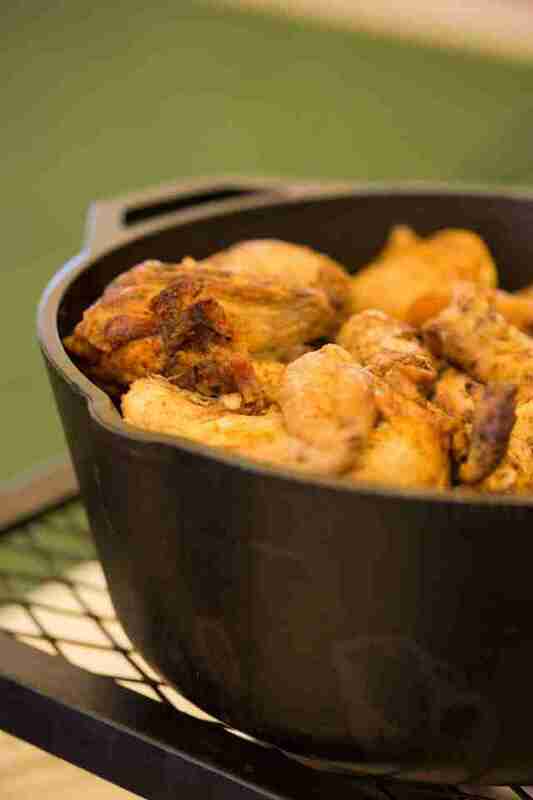 She served her guests heaping platters of their rightfully famous chicken on a stick. The dish has become the stuff of legend among the Ole Miss crowd, inspiring knockoffs at other gas stations around town. But none compare to the Four Corners. A foot-long chicken tender is seasoned with a top-secret spice blend, battered, fried until the skin is crisp enough to snap between your fingers, and then impaled, kebab-like, on a skewer. 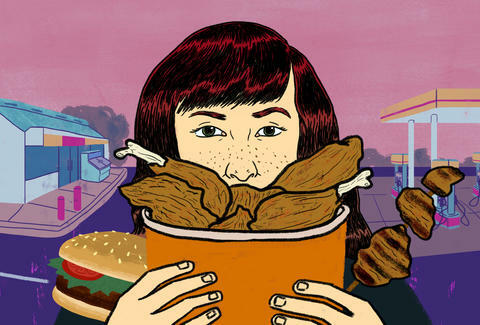 The ease of gobbling perfect fried chicken off a stick might be what makes Four Corners the perfect late-night snack spot for generations of students, who stumble in after last call to soak up some of the beer in their stomachs. And it has made the Four Corners a community center of sorts. "We have people that have been coming in since I started," Lantrip-Cevera said, "and the college students become like family. We take care of them, especially the ones that come in late at night. They come in here and act stupid, and you watch them grow up." The food at the Four Corners, like many gas stations in the South, is simple and tasty; there are no drizzles, no deconstruction. It's built from tradition and served with the care that the cooks and owners would take in making a meal for their own families. To some degree, the customers are family. In short, the food is honest. Southerners know the best meals in town aren't always served on white tablecloths. Often, they come golden-fried or hot out of the oven, tucked in a red-and-white-checked paper sleeve from behind the counter at an Exxon station. In other parts of the country, one gas station is nearly indistinguishable from the next, but in the South cooks serve recipes based on grandmother's pickled okra or dad's chili. These chefs ensure that Shell stations in Mobile and Baton Rouge are the same in name and signage only. Inside, they're as different as the cultures around them and the communities they serve. Look at Billeaud's Grocery, which is housed in a Broussard, Louisiana Shell station. 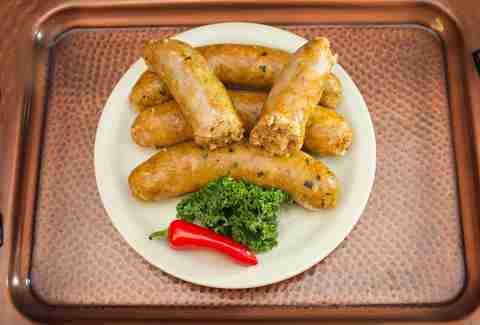 It is world-famous for its boudin, a traditional Cajun sausage stuffed with rice, vegetables, and pork, along with homemade cracklins and old-school tubs of lard. Billeaud's boudin is widely regarded as the best in the state not only for its consistency, which comes courtesy of a perfect meat-to-vegetable-to-rice ratio so that each bite offers a bit of all three, but also for owner Billy Billeaud's famous signature spice blend, which is smoky and sweet, well-spiced without being uncomfortably hot, and just salty enough to hold up to an ice-cold beer. Out front, food tourists pump gas shoulder-to-shoulder with townies before heading up Highway 90 to meet I-10, which takes them out of Cajun Country and into the world. In the rural farm district where I grew up, great gas station food was as normal as Friday night football games. We only had one stoplight in Benton, Louisiana. An errant cow in the high school parking lot caused half a day's excitement. And the best place to get a burger was the Chevron station, a brown-and-gray tin box that travelers passing through on Highway 3 wouldn't look at twice unless their tanks were empty. My preference for this gas station burger wasn't because I was so culture-starved that I mistook a blackened lump of charcoal for a delicacy. I've eaten burgers on three continents, everywhere from trendy Brooklyn industrial whatevers to Ecuadorian street carts. But that Chevron burger, a hunk of soft fat and crusty salt, charred on the outside and pink in the middle, covered with American cheese atop a grill-browned Sunbeam bun, remains the standard I eat toward. At lunchtime most days, I could find my grandfather in one of the Chevron's dozen booths tucking into a plate of chicken-fried steak that had been pounded damn near translucent then battered to a crunch and smothered in creamy white gravy, the alfredo sauce of the South. The waitresses, cheerful women with bright lipstick who dotted my childhood like twinkle lights, doted on him, calling him Mr. Ted and bunching around his table to chat about when the heat would break or when the high school baseball team would win. They'd bring me a burger when I sat down across from him. "Let me talk to my granddaughter a minute," he'd tell them, and they would scatter until he needed another glass of tea. A few years back, the Chevron changed hands, and like that, the small-town institution was gone, replaced by a second stoplight, a Sonic, and a Pizza Hut. Losing that Chevron meant losing a connection to my grandfather. It also felt like losing a piece of my Southerness even though I hadn't lived in that town for over a decade. Maybe one reason for the South's great gas station food is the fact that we're a car culture; you'll rarely catch a Southerner walking outside his or her own neighborhood. Most small towns below the Mason-Dixon are bisected by roads with numbers for names, and we give directions using interstate exits as landmarks. 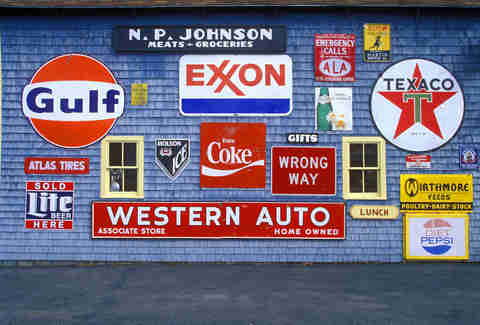 In the South, you're never more than a few minutes from a gas station. But even before the invention of the automobile, travelers in the South ate from the comfort of their train cars. Empires have been built of used napkins soaked in hot grease, discarded by a hundred years of hungry out-of-towners just passing through. In the years following the Civil War, Gordonsville, Virginia was known as the "Fried Chicken Capital of the World." Though the town only boasted around 900 residents, it was a hub for produce transported from Virginia's Shenandoah Valley, a major source of grain for the entire country, once known as "The Breadbasket of the South." The town provided a junction for the state's north/south and east/west rail lines. Even though the trains passing through Gordonsville supplied grain to much of America, they didn't have dining cars then, meaning passengers were usually starving by the time their trains stopped off in Gordonsville. Seeing opportunity in all those hungry bellies, African-American women, many of whom were newly freed slaves, carried trays laden with homemade biscuits, pies, and, most memorably, fried chicken. They hoisted their wares right up to the windows of passing trains, trading handkerchiefs full of chicken for handfuls of money, becoming some of the Reconstruction era's first African-American entrepreneurs and earning financial independence in the process. In 1970, Bella Winston, the daughter of one of Gordonsville's famous chicken vendors, said of her home, "My mother paid for this place with chicken legs." And while the chicken-to-train trade is a thing of the past in Gordonsville, its legacy lives on in gas station fried chicken. "A dozen fully functioning gas stations in Gordonsville still serve the best fried chicken you'll find in the world," said Michael Stern, the James Beard Award-winning author and co-founder of Roadfood.com. "They don't make a big deal of that history, but in most cases, fried chicken is all that's on the menu in those stations." As Southern food and soul food became au courant in urban hotspots across the country, there has been an impulse to dress it up in bone marrow butter. But the places serving such nouvelle variations miss the point of truly great Southern food: It's not supposed to be fussy. The granddaddy of Southern gas station food, the store lunch, was as far from fork-and-tablecloth dining as possible, but provided comfort food to generations of Southerners from all sorts of backgrounds. From the late 19th century to as recently as the 1950s, the store lunch was typically available at rural Southern general stores to anyone who had business in the country, from farmers to hunters, surveyors, and fishermen. Just like the snacks available in modern-day gas stations, the store lunch consisted primarily of salted meat followed by sugar. A store lunch might contain an 8oz can of pork and beans, homemade sausages sprinkled with hot sauce, a pig's foot or egg pickled in beet juice and vinegar, plus a cellophane-wrapped oatmeal cookie for dessert. The food was simple, meant to be eaten off a knife blade, but it was hearty, affordable, and readily available to anyone who was hungry. And while the pink jars of pigs feet or pickled eggs are increasingly rare at your standard Southern Shell station, I remember them well from my childhood. Many a high school bet was hedged on eating those eggs, much to the confusion of our grandparents, members of the Greatest Generation and children of the Depression, to whom pickled eggs were not just sustenance, but a delicacy. I can remember reacting with surprise to the fact that my grandmother had eaten those pink eggs, floating in their mystery liquid, not once, but many times. "They're not bad," she told me, which, coming from my grandmother, meant they were very good. The store lunch also lives on in bags of homemade cracklins soaking grease through parchment paper, baskets of hard-boiled eggs, and kettle warmers full of spicy boiled peanuts, which are always stacked by the register at any gas station worth its salt alongside I-10. For Southerners, these finger foods are impulse buys; to our northern friends, they're abominations. "You're going to eat that?" they ask us. "They're not bad," we tell them. But the appeal of Southern gas station meals lies not just in the quality of the food, but also in the place itself. Southern Foodways Alliance filmmaker Kate Medley recently spent weeks documenting gas station food culture in the Mississippi Delta, and what impressed her most were the people who came together at their local gas stations for hot food and cold beer and, above all, the company. "One thing that was really interesting was the diverse cross section of people hanging out at these places," Medley said. "It was unparalleled to any other space in the community. Parents in minivans buy after-school snacks with farmers coming through to pick up supplies. You've got college kids looking for beer right next to the mayor, poor people, rich people, and everyone in between from every different ethnicity. You just don't find that anywhere else." Perhaps more than those from any other region, Southerners like to know each other. For all of our racial and political divides -- of which we have plenty -- we still like to stop and talk in the aisles of the grocery store; to know not just our postman's name, but the town in which he was born and the names of his children -- details my mother could recite in her sleep. That longing for connection shows up in our food as well. Gas station biscuits and gravy tastes like it was made by a person, not a machine; tradition and pride are served up from behind a plastic case, one meat pie or potato log at a time. All this can leave outsiders wondering why we'd put so much effort into food that, to them, matters so little. "I've wondered that myself," Stern said. "I can't explain why around here, gas station food tends to be excellent, instead of mediocre, except that in the South, culinary standards tend to be higher. People tend to expect better food. I suppose any place could get pre-fried chicken and heat it up, but here, gas stations honor their customers by not serving crappy food." Stern points to chefs like Chris Williams, of Roy's Grille in Lexington, South Carolina, whose shrimp and grits is the creamiest blend of starch and pan-fried seafood he's had. Roy's Grille is named for Williams' hardworking grandfather, Leroy Carter, who woke up at 5am to work odd jobs before reporting for duty at the local sawmill, where he oftentimes worked until midnight. Roy's is the type of establishment where mill workers would have felt comfortable having a meal and relaxing a bit between bouts of backbreaking work. The food is as straightforward as it is delicious, based on recipes Williams learned at the hands of his mother and grandmother in Olar, South Carolina, a town of just 257. "My mother and grandmother started the fire that burns inside of me to cook food," Williams said. "I grew up asking questions, learning to make rice and fry chicken." Now, Williams makes those same recipes for the customers at Roy's, adding personal touches that even fine-dining establishments often overlook. He bakes his own yeast rolls and buttermilk biscuits from scratch and prides himself on being the only restaurateur in Lexington who cures his own bacon. Behind the gas station, he's set up a smoker for pork and chicken legs, and he works them into playful takes on classic diner food, like pulled pork nachos and Carolina cheesesteak, which substitutes homemade pimento cheese for Cheez Whiz. "Regulars don't have to place an order because Chris starts cooking when they walk in," Stern said. "They're part of an ad hoc family, and they treat the place with the same respect they would a relative's house." Like his hard-working grandfather before him, Williams paid his dues working in any kitchen that would hire him before opening Roy's Grille. He worked in restaurants for 20 years, everywhere from McDonald's to fine-dining establishments. But like a true Southerner, he thinks of a gas station as just as good a place to eat a delicious meal as any other. A couple of years ago, when Williams was working as a caterer, a client suggested he check out the empty kitchen of a local Exxon. Williams said the owner of the station was tired of people who would "be in here a few months and fizzle." Williams said he whipped out a local newspaper write-up about the quality of his food to show he was serious, and 30 days later, he was running his own kitchen. Like the women who built empires from fried chicken passed through train windows, or the Billeaud family serving one of the state's most authentic tastes of Cajun heritage alongside Powerball Quick Pick lottery tickets, when the chance to open his own food venture came, Chris Williams wasn't going to pass up the opportunity just because it came in the back of an Exxon. Of course, gas stations aren't the only strange places Southerners go for a good meal. When I was in graduate school in Lake Charles, Louisiana, the spiciest, most perfectly proportioned boudin in town came from a cooler behind the counter of a liquor store. Was it FDA-approved? Probably not. Do I still stop there, 10 years later, any time I'm passing through? Absolutely. Like almost every Southerner I know, to me, good food is good food whether a waiter hands it to you on bone China or you buy it by the plastic bagful alongside a six-pack of Turbodog. "Where I grew up, the best hot dogs in town were from an Exxon with homemade chili and the whole shebang," said Williams, laughing in his kitchen above the chatter of customers waiting for their shrimp and grits or pulled pork nachos. "I grew up knowing the value of that type of food. It's real." Emily Alford keeps Louisiana Hot Sauce in her glove box in case of emergency. Her work has also appeared at BuzzFeed, Lenny, and Vox, and she recently completed her first novel, Bless the Girls. Follow her @AlfordAlice.